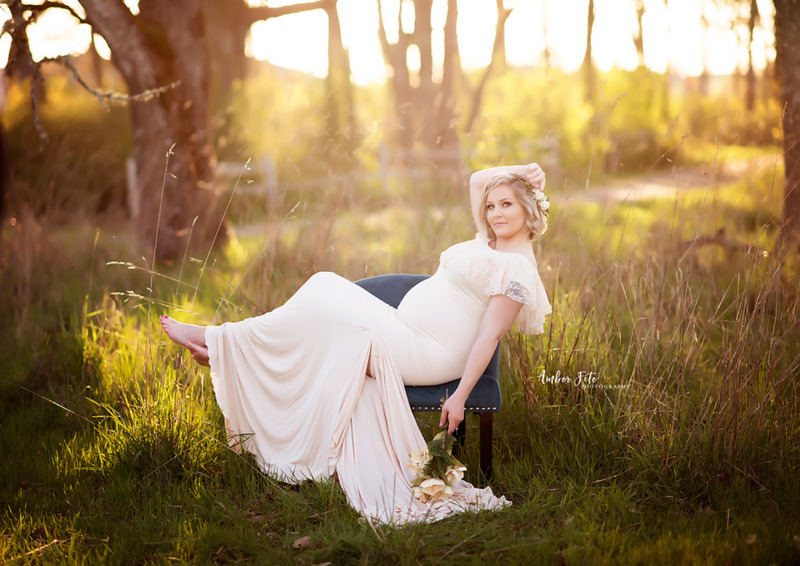 Now that we're well into spring, I thought it would be a prime time to go over a few ideas for beautiful spring maternity photos. The great thing about this time of year is that there's a rebirth of the world around us with flowers, trees, and other plants coming back to life after a long winter. 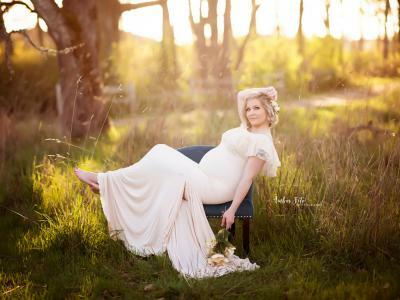 That means that there are gorgeous outdoor scenes that are rife with possibilities for maternity photography. Here are just a handful of maternity photography tips to help you get your game on! Editor's Tip: If you want to earn extra income (who doesn't?!) join our top-rated photography affiliate program. Get the details here. 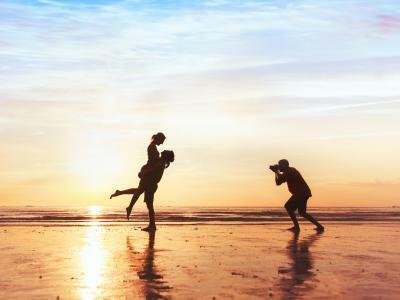 With the arrival of warmer temperatures, that means that you can get a little more creative with the wardrobe selection for your maternity photo shoots. A particular favorite of mine is to feature the model in an off-the-shoulder gown like the Elia Gown by Sew Trendy that's shown above. Adding a little skin to your maternity portraits makes for a sexier shot, and might give your model a little more confidence being in front of the camera. Another quick tip is to add accessories that bring more color and texture to the shot. 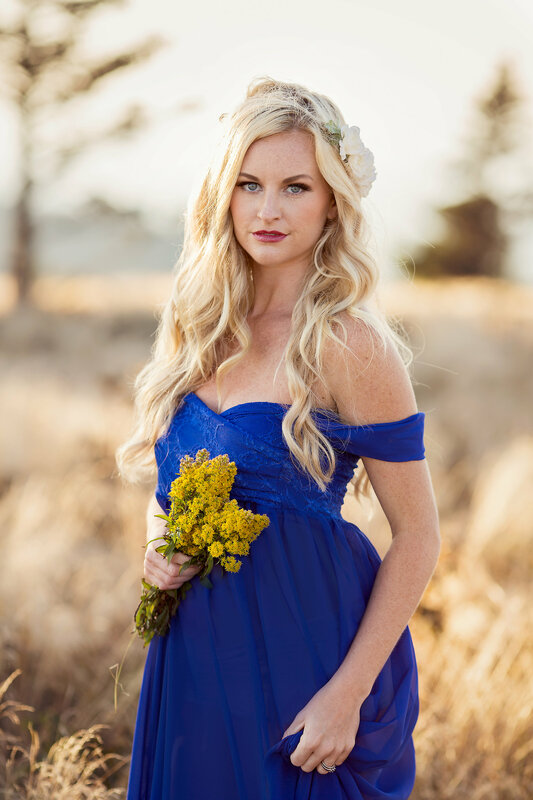 In this case, the simple floral bouquet contrasts nicely with the deep blue color of the dress. 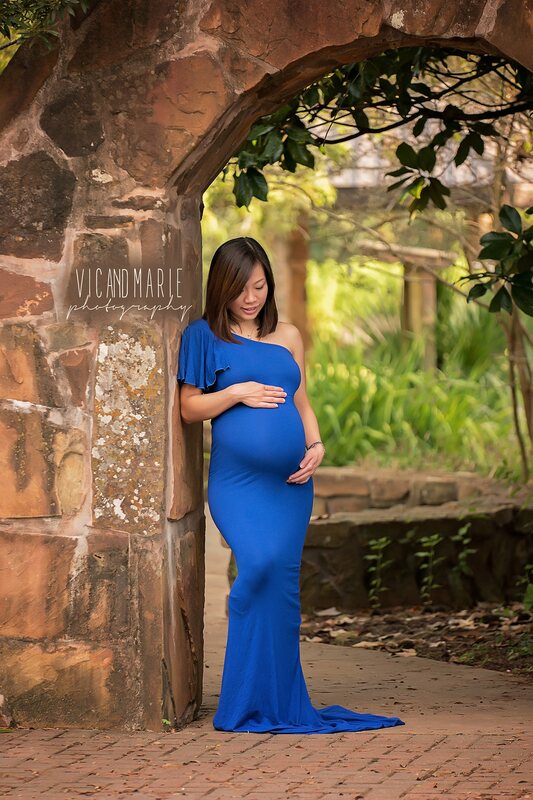 As the trees get their leaves and flowers begin to bloom in spring, you have all sorts of colors, shapes, and textures at your disposal to add visual interest to your maternity photos. In looking at the example above, you can see how bright and lively this image is. That's certainly due in part to the light background, but it also has a lot to do with the colors of the foliage in the photo. Something else to note in this image is that the foliage is used as a frame, which helps direct our attention to the model. But using the bounty of spring doesn't have to be so overt. Instead, as you can see in this image, all the colors and shapes of the plants take a backseat and appear mostly in the background of the photo. The different tones of green in the background give a liveliness to the shot that would be hard to achieve in the winter. Additionally, notice again how the photographer has used both natural and manmade elements to frame the model. Editor's Tip: Small details like accessories often make or break portraits. Find beautiful maternity photography accessories for your photos. We have gorgeous sunsets pretty much year-round where I live, but there's something about a sunset in the spring that sets it apart. The colors seem more varied and vibrant. 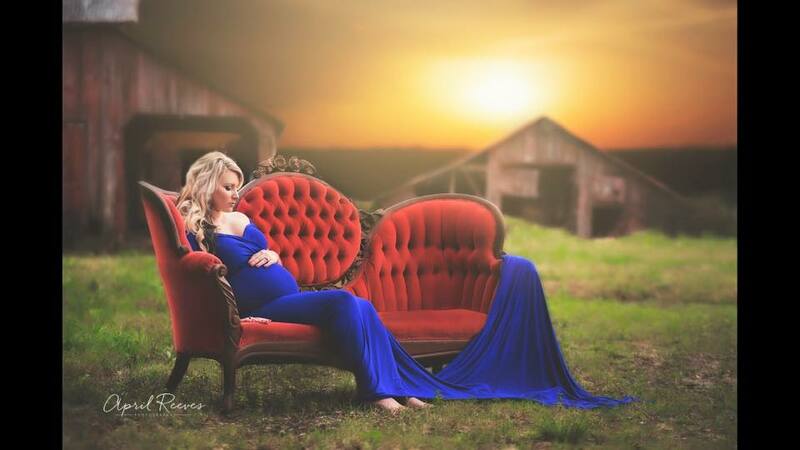 Naturally, a sunset is a beautiful backdrop for a springtime maternity photo. As shown above, the range of yellows, pinks, and purples in the sky pair perfectly with the deep blue color of the Rachel Gown and the deep reds of the accessories worn by the model. The light at sunset is also ideal for portraits because it's soft and golden, and that will help give your model a warm glow about her. Of course, you can also use the setting sun as the backdrop of the shot if you want something that's next-level dramatic. In the image above, the burst of golden light from the sun adds a richness and brightness to the shot that contrasts beautifully with the darker tones in the foreground. In particular, blue and orange pair well together, so putting the model in a blue dress complements the orange sunlight was a perfect choice. 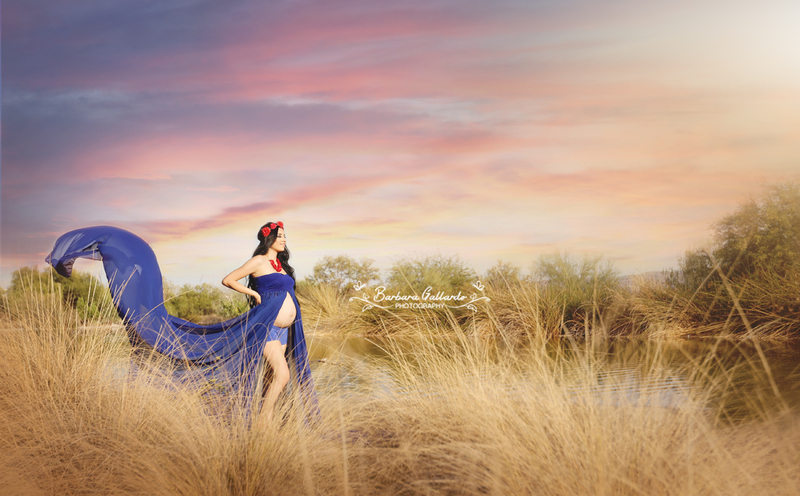 In the end, springtime maternity photography is all about taking advantage of warmer temperatures, gorgeous light, and the colors and textures of the new life that comes forth this time of year. In that regard, it's a perfect backdrop for taking photos of moms-to-be that will soon have their own bundles of joy!